Dance is a career that seems to be aimed at the young. Little ones start as early as three years old with dreams of twirling onstage, and a career is often thought to “fade out” around their mid-30s. 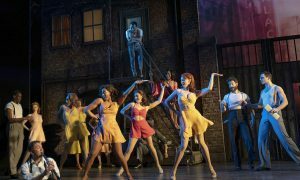 But there can be something beautifully unique about dancers who continue to perform in their “later” years, with life experiences and perhaps even parenthood adding to their art. Xiao Nan Yu. Photo by Aleksandar Antonijevic. The National Ballet of Canada’s Xiao Nan Yu is one such artist. Born in China, she followed her dream to dance and arrived in Canada on her own as a teenager, not speaking a word of English. She trained at Canada’s National Ballet School and joined the company in 1996. During her time with the company, Yu met her husband and became mother to two children, while still performing lead roles and gracefully balancing her career and family life. Now, this June, Yu will retire from the stage, after 22 years with The National Ballet of Canada. Her final performance will be in one of career signature roles, Hanna Glawari in The Merry Widow. Xiao Nan Yu in ‘The Winter’s Tale’. Photo by Karolina Kuras. Yu reflects on her arrival to Canada as a young teenager, not knowing any English or much about the area. She recalls being picked up at the airport by a staff member from Canada’s National Ballet School, who held a sign depicting a pointe shoe so she would know where to go. The transition was full of the unknown, was scary, perhaps lonely. But at the same time, Yu says that the time was a thrilling one for her, with not knowing what may lay ahead in her journey and the thought of exciting opportunities to come. She has danced principal roles in dozens of classical and contemporary works in the company’s repertoire: Swan Lake, Romeo and Juliet, Onegin, The Sleeping Beauty, Giselle,The Nutcracker, Cinderella, Serenade, Apollo, The Four Temperaments and many, many more. In 2009, Yu won the Outstanding Profile – Arts, and Best of the Best Awards at the Mandarin Profile Awards in Toronto. In 2018, she was the recipient of the Rolex Dancers First Award for her role as Paulina in The Winter’s Tale. And perhaps one of the most major roles Yu has taken on during her time with The National Ballet of Canada is that of mother of two daughters, now 14 and seven years old. Guillaume Côté and Xiao Nan Yu in ‘Nijinsky’. Photo by Aleksandar Antonijevic. 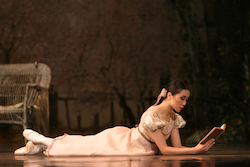 Xiao Nan Yu in ‘Onegin’. Photo by Cylia von Tiedemann. Yu’s final bow will be as the title character of Hanna Glawari in Ronald Hynd’s The Merry Widow, which will round out the company’s 2018/19 season, running June 19-23, at the Four Seasons Centre for the Performing Arts in Toronto. She says the role has been a favorite during her career, one that helped define her professional life. Yu is excited for what’s to come after her final curtain call. For so long, she says, life has been ballet, and while ballet has taught her determination, dedication and passion, she is looking forward to taking time to decide what to pursue next. Of course, she hopes to stay connected to the ballet world, passing on her experience and knowledge to the next generation of dancers. Xiao Nan Yu with artists of the Ballet in ‘The Sleeping Beauty’. Photo by Aleksandar Antonijevic. While the Toronto audiences will surely be sad to see Yu move on, Yu seems to feel at peace with where she has come and when she is making the choice to depart the stage. Xiao Nan Yu’s final performances will be in The National Ballet of Canada’s The Merry Widow, to be presented June 19-23, at the Four Seasons Centre for the Performing Arts in Toronto. For tickets and more information, visit national.ballet.ca/Productions/2018-19-Season/The-Merry-Widow.